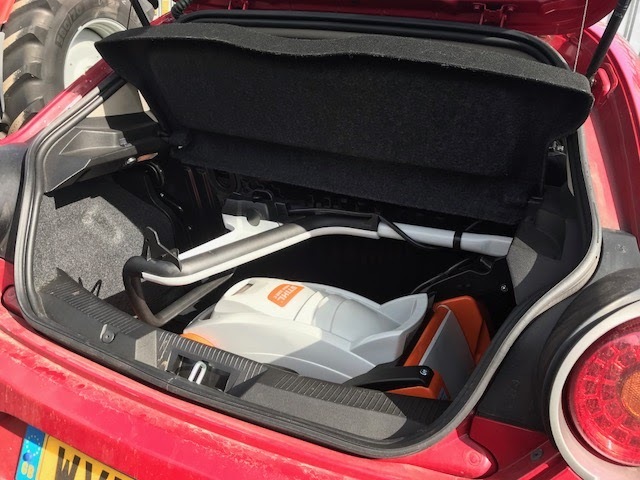 It fitted in the boot. Admittedly the grass collection box has to sit on the passenger seat, but I had been worrying about how I would get it home and my worries were totally unnecessary. The handle folds down really easily by moving the side catch and it just clicks into place when you make it upright again. 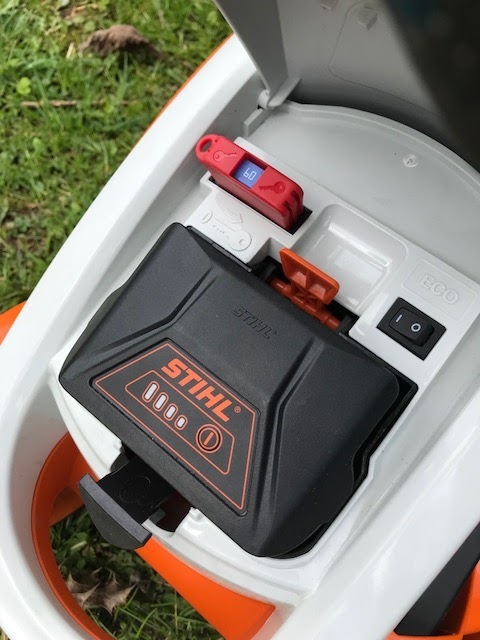 The mower uses the same battery as the chainsaw and grass strimmer that I already have trialled so this means no worries about whether one battery can mow the whole lawn. and helpfully you can check the battery life with the top casing in place. 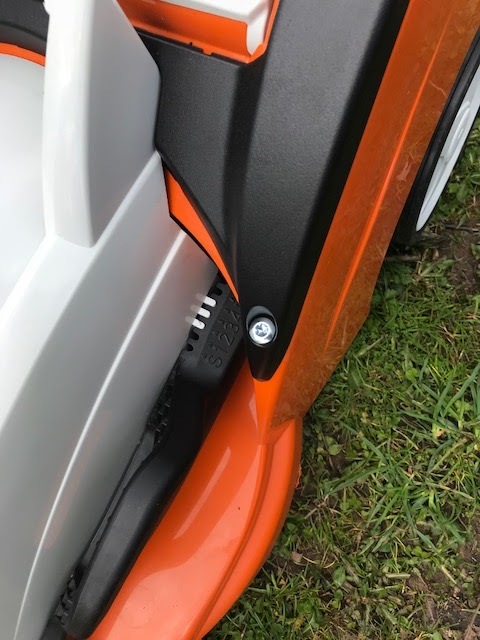 The height adjuster is nice and easy to use. 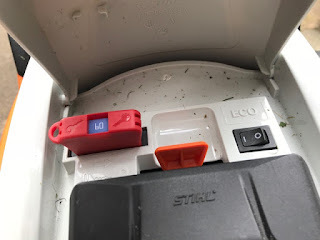 and there is a useful safety key that you can remove to completely disable the motor it you go near the blades. 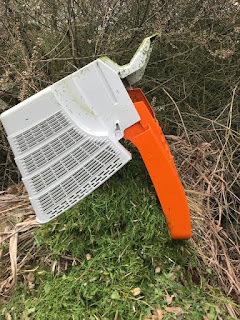 Also, you can of course remove this when you pack the machine away after use so that it is useless if it gets stolen. Do not, though, take it out with this in mind and then wonder why it will not start the next time you use it. Equally, do not at this point wonder where you did put the key for safe keeping. You might also notice a black switch with the word Eco above it. This switches on the Eco-mode. 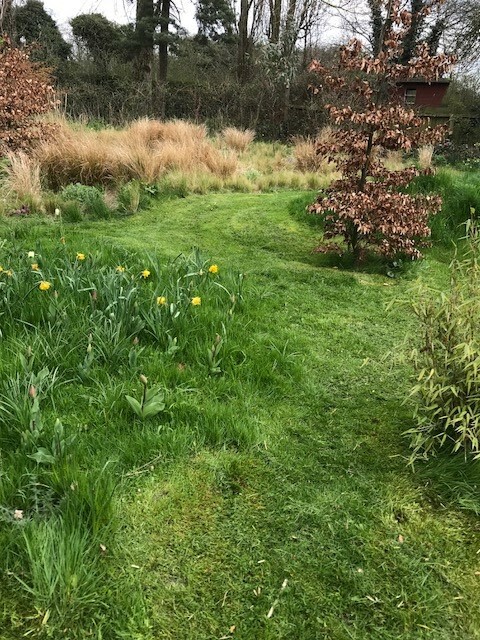 With this switched on the mower happily mows along a bit like a sheep nibbling along the lawn eating the shorter easier grass at a nom-nom-nom type rate. Once it hits grass that is a bit longer, the engine speeds up a bit and it chomps away NOM-NOM-NOM. This means that the battery is saved from over-tiring itself until it is really needed to put in a bit more oomph. This is perfect for my kind of lawn that is not super smooth and flat. 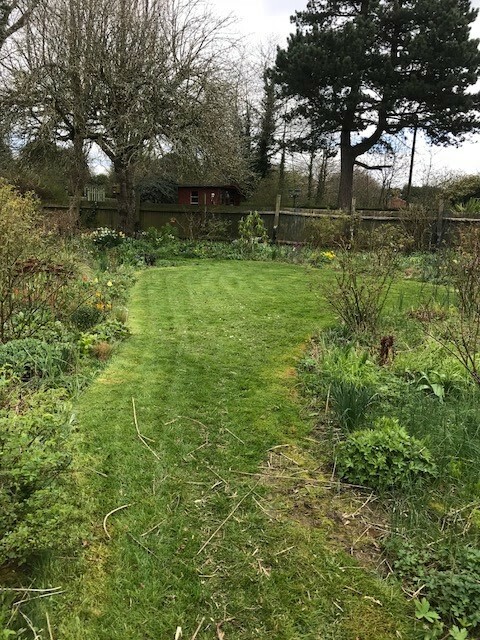 On the day I tested the mower the grass was long. Firstly I mowed the driveway and then went around the back garden. The formal lawn was looking rather messy from the cutting back of winter detritus in the borders. The grass was also not completely dry. I set to work and soon the formal lawn was looking much improved. 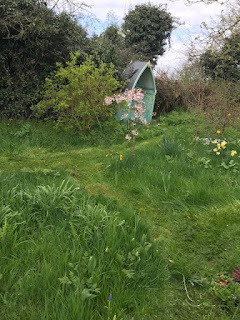 The mower still had good battery life so I continued on to the Dancing Lawn and around the Prairie Borders. I had the blades set to a medium height and it was coping with the conditions with ease. 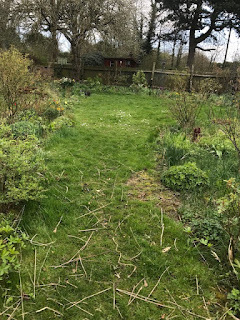 I had to raise the blades to cut the paths through the Wild Garden, this is to be expected, the grass was a bit longer in this area. After nearly 40 minutes in total of quite tough mowing conditions the battery ran out. I popped in the spare I had, which had stayed charged right through the winter, and finished off in about five minutes. If the grass had been shorter and drier and I am confident it would have mowed the whole garden in one go. Did I mention the grass-box? This is also rather clever. 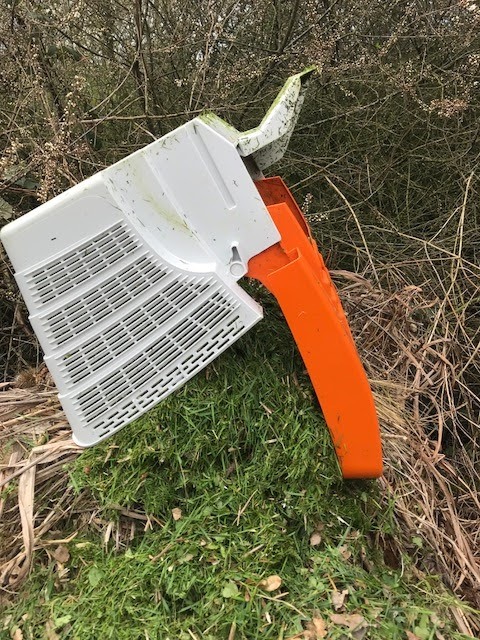 It has a flap indicator that stands up whilst you mow and then goes flat when the box is full (yes, the other way around to usual indicators) apparently it is worked by the air flow in the box so when the air cannot flow because it is full, the flap flops. I liked how the grass-box lid opens to allow the cuttings to be tipped out. This means it empties quickly and properly. In terms of capacity it holds a lot of cuttings, it is 40 litres in size. This mower is aimed at small to medium sized lawns and I would agree with this. I would not have wanted a larger mower even though I have quite a bit of lawn due to as mentioned above, I need to be able to mow around things. 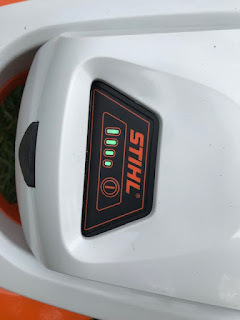 It is well made and has that promise of quality that all Stihl products have. The mower retails at around £350 which I think is a very good price. 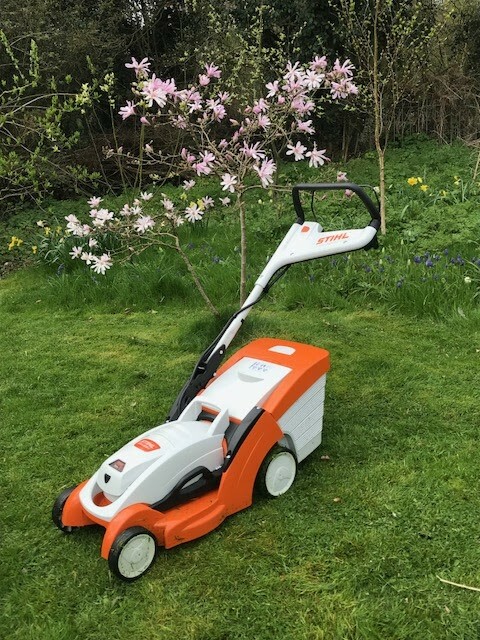 This is a good quality Lawn Mower, I feel, a good lawn mower is essential to maintain beauty of your garden. What do you think about it.